What makes Mexican tales of the fantastic Mexican? What differentiates them from American, British, or even Russian speculative fiction? If you let the ambiance of the stories in Three Messages and a Warning: Contemporary Mexican Short Stories of the Fantastic wash over you, you’ll have a pretty good chance of finding out. If you’re expecting a Taco Bell view of what is Mexican literature, you’ll need to look elsewhere. These stories beat with an authentic pulse. They touch on topics common in speculative fiction—regardless of which culture it comes from—such as ghosts, mermaids, aliens, and other creatures of the supernatural. But they come to these topics with a unique perspective, sensibility, and style. Bruce Sterling, in his introduction to this anthology phrased it this way, “Mexican SF is a science fiction with no popular mechanics, no problem-solving stories, and very little ideational extrapolation. ‘Hard SF’ never took root in that soil.” This collection is filled with ghost stories, futures that feel like fantasy, and souls that long for things they can never quite have. The anthology’s editors, Eduardo Jiménez Mayo and Chris N. Brown, collected in this book a selection of 34 original contemporary Mexican fantasy and science fiction stories, none of which have been published before in the U.S. All were originally written in Spanish and were translated for this book, a project that took two years. The thread that connects these stories is a uniquely Mexican sensibility. These stories were written from a cultural perspective in which the veil between the physical world and the spirit world is often expected to function as a mere suggestion, rather than a barrier. This is most evident in the ghost stories where the supernatural element is taken in stride, rather than met with shock or surprise. You can feel this difference when alien vampire bats search for new land to conquer. You can sense it in when a woman uses magic to go back in time to find her true love. You know it when mutant fireflies make people disappear like a bubble of soap. When reading a translation, it can be difficult to tell if what you are responding to is the author’s intent or the translator’s interpretation of that intent. This is particularly true when you read something that has only one author and one translator. But this book not only has multiple authors, but multiple translators as well. You may not be able to tease out the nuances between author and translator in any individual story, but the overall experience of what makes these tales quintessentially Mexican shines through, a result of the averaging of many voices. As with any anthology, the true strength of this book is the quality of the stories themselves. If you judge a short story by how it leaves you feeling when you are done, by how long that feeling lasts, and by how often you find yourself reliving your reading experience, then you will be pleasantly rewarded by this collection. There is an underlying emotional quality to these stories that sets them apart from those written by Americans, Canadians, Brits, and the like. And yet they are accessible, entertaining, and altogether human—just like those other tales. 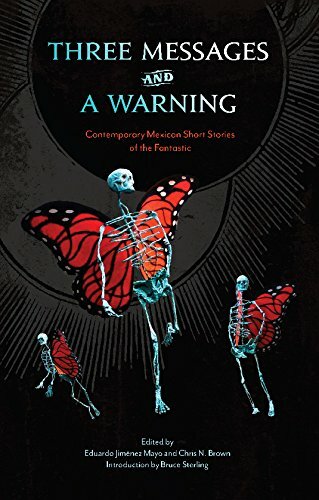 If you’re looking for something familiar and yet different, you can’t go wrong with Three Messages and a Warning: Contemporary Mexican Short Stories of the Fantastic.